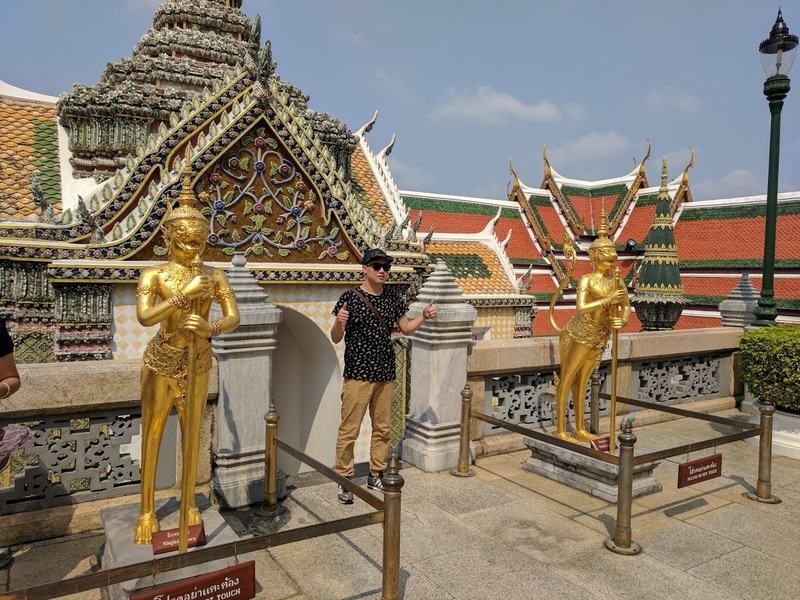 On our third full day touring Bangkok, we decided it was time to see the requisite sights where all tourists are directed. 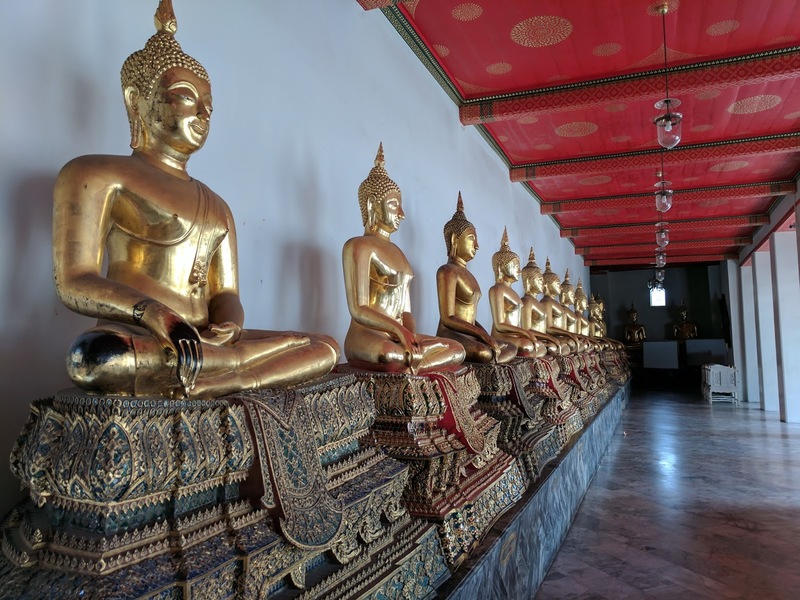 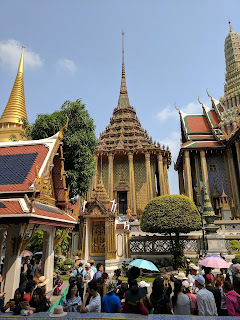 The famous Grand Palace compound, including the ornate temple complex of Wat Phra Kaew, and the nearby giant reclining Buddha at the Wat Pho temple. Our hotel, situated in the 'Old Bangkok' neighborhood of Banglamphu, was well situated to easily access both of these popular attractions that reside on the man-made Rattanakosin Island on the banks of the Chao Phraya River. 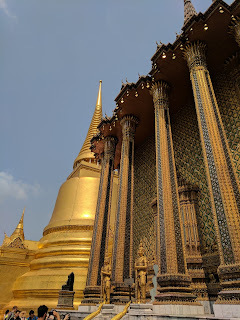 Our hotel offered a free tuk-tuk ride to these sights, which we took advantage of at the earliest scheduled hour we felt we could commit to, 9:30am, with vague fears of jetlag still in our heads. 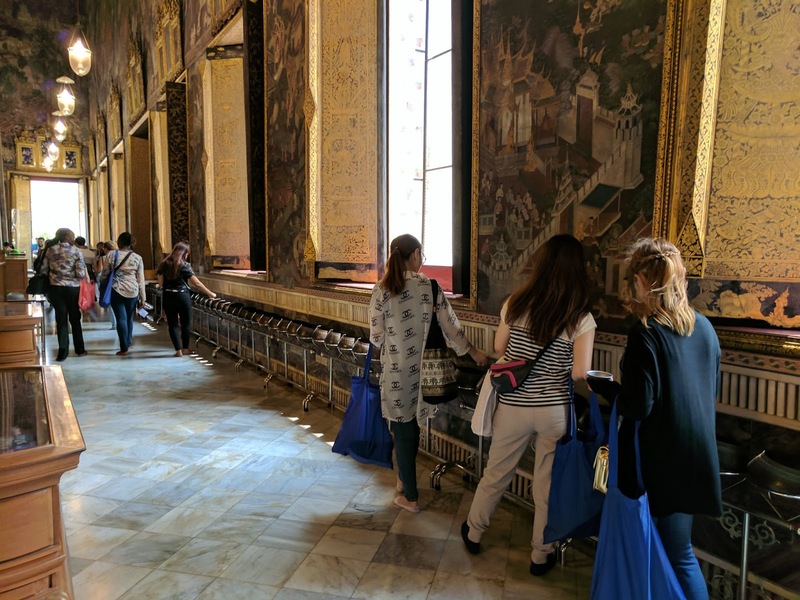 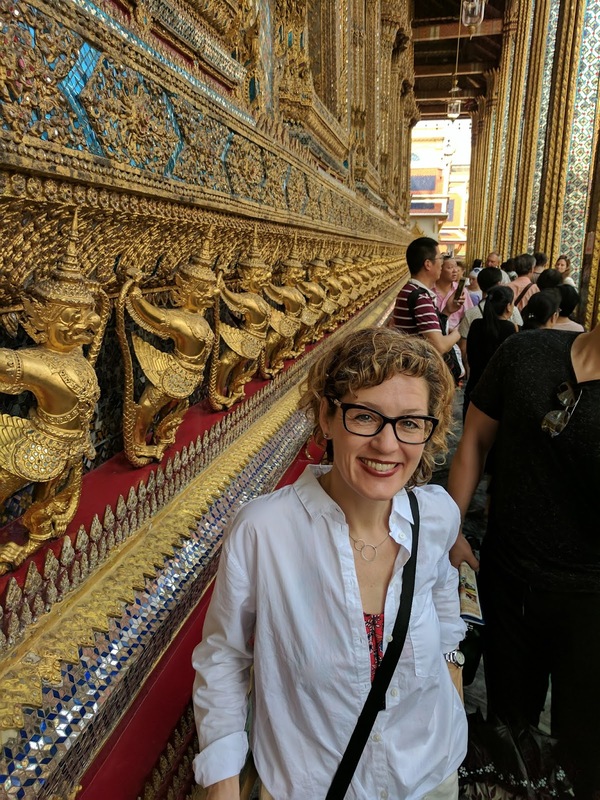 Upon arriving at the expansive grounds of Grand Palace, it was clear that we'd finally figured out where all of the tourists were. The Khao San Road district seemed bustling with foreigners visiting Bangkok, but after seeing the hoards at Wat Phra Kaew, it made Khao San Road seem downright peaceful. 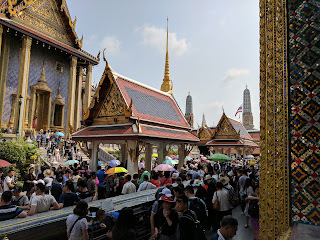 The mostly-Asian tour groups were coming in by the busload, and we were caught up in the crush trying to enter the compound as if we were at Grand Central Station trying to get on the 4 train at evening rush hour. 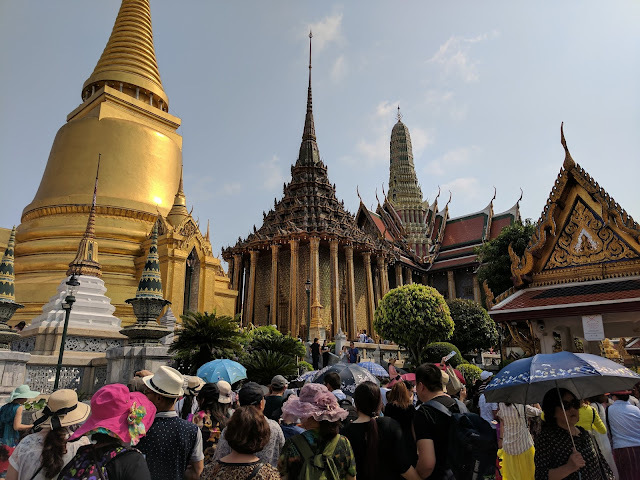 The fact that it was in the upper 90's, and easily the most humid day yet, made it feel like we were putting in some real effort to accomplish our tourism duties. Of the three sites, easily the most impressive and interesting was Wat Phra Kaew. 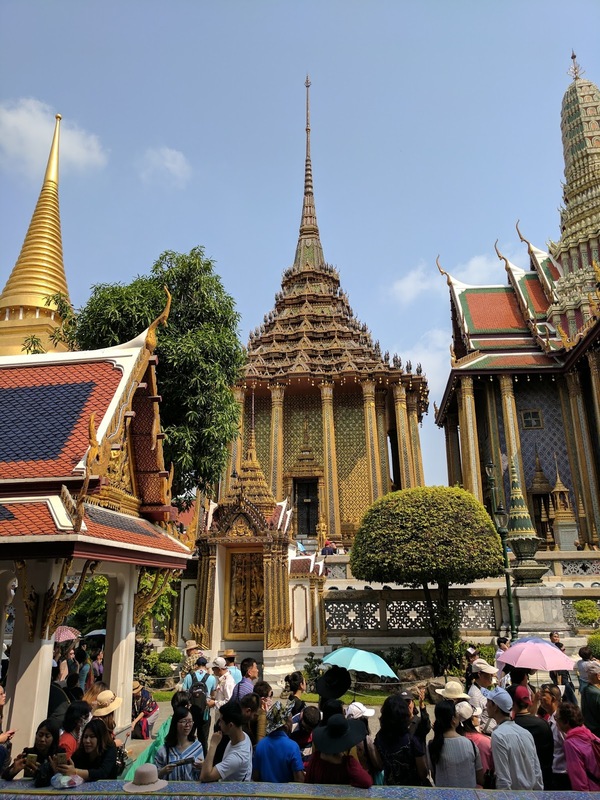 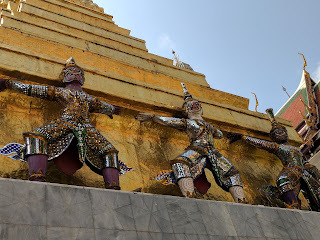 Of its many lavishly gold- and statue-adorned buildings, the highlight of this important Buddhist temple compound is the temple of the emerald Buddha (spoiler alert - it's actually carved from a type of jade - not made of emerald). Along with the masses, we shuffled our way toward this temple, put our shoes in a designated shoe nook, and squeezed our way in. After all of the effort of getting here through the streaming, teeming crowds, I was prepared to be underwhelmed, but the ornate grandeur of the place is indeed very impressive. 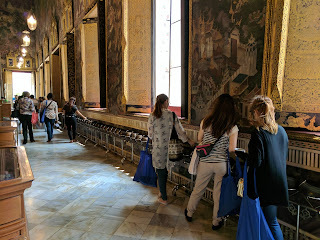 Most of the tourists were themselves Buddhist, and made their way as far forward as allowed, in order to be able to kneel down and give offerings of flowers, while we hung in the back taking in the Buddhist bling. 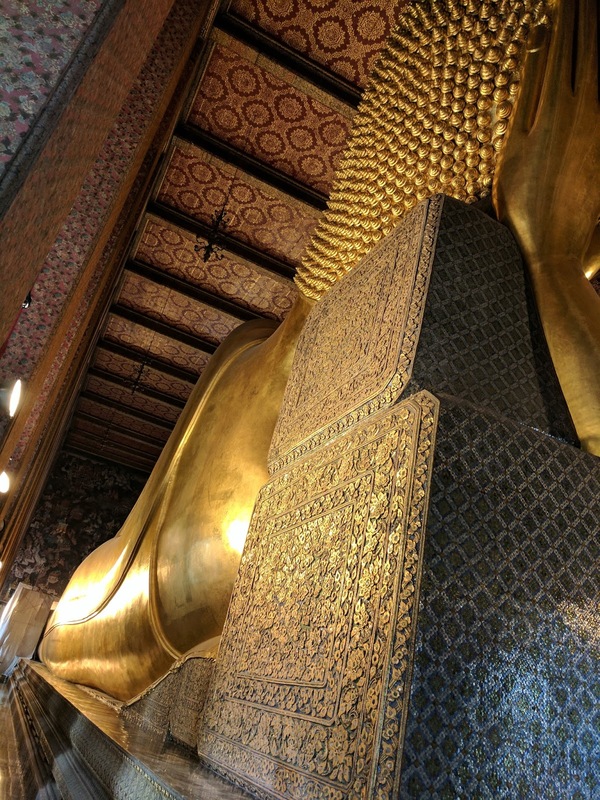 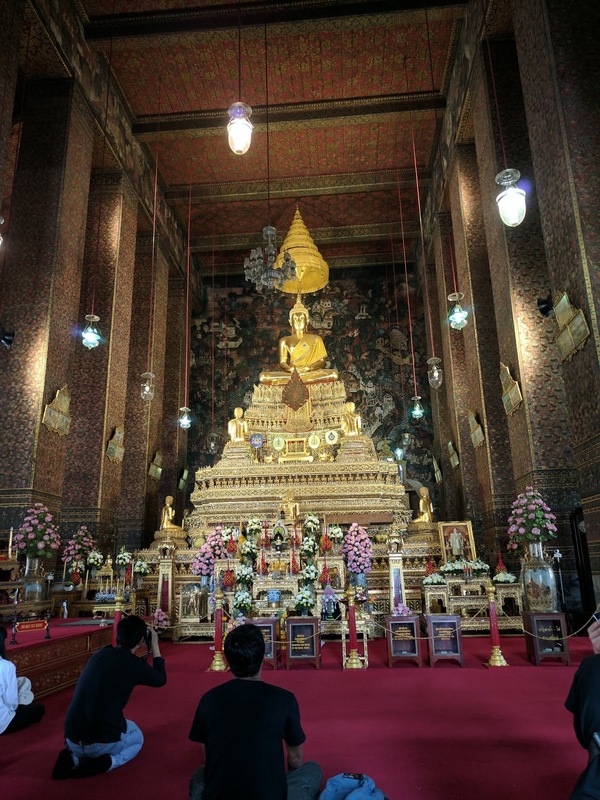 The actual emerald Buddha, in sitting pose, measured a diminutive 26 inches tall, and was placed on bejeweled platform high above the crowds. His golden "outfit" is changed three times per year, for each of the three seasons. 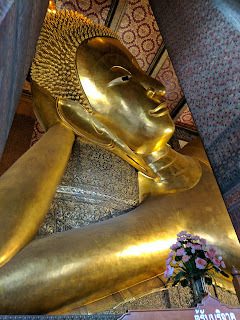 He was still dressed in his winter-wear on the day we visited. 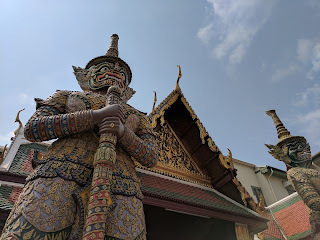 Sorry, no photos allowed in the temple - you'll have to visit Bangkok yourself if you want a peek. 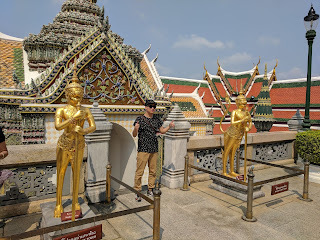 We won't go into the detail of the history and significance of the sites (Grand Palace = residence of King of Siam since the 18th century, Wat Phra Kaew = temple of the Golden Buddha, Wah Pho = giant reclining Buddha, which is impossible for either of us to say or type without the song "One Night in Bangkok" popping into our heads). There are many great internet tools out there if you'd like to learn more. We'll just share that we spent at least four hours between the three locations, including a stop for mango and watermelon fruit shakes in between. 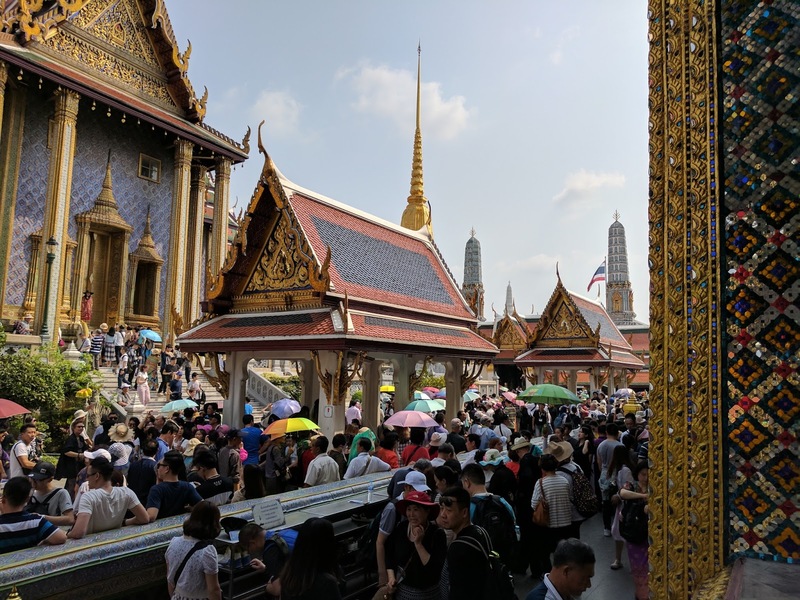 Even with the refreshments, we were melting in the heat, and exhausted from the crowds and exertion. 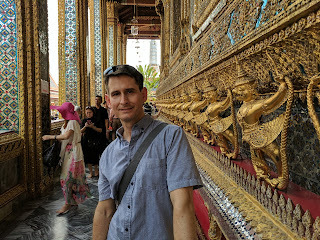 The best idea seemed to be to find somewhere cool (in temperature) to sit and have some cold beverages. 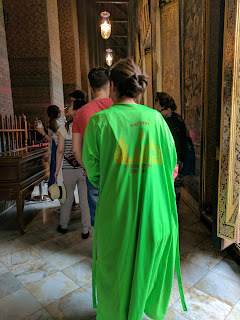 We had heard that the historic Oriental Hotel was worth a visit, and seeing how it was just down the river from where we were, we thought it could be pleasant to take a river ferry, which appeared to be a convenient door-to-door ride. 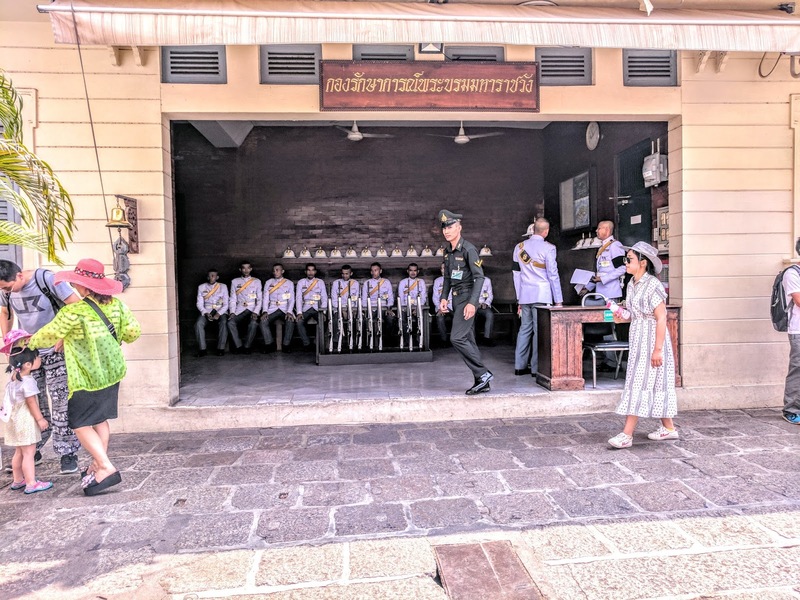 Well, with the departure pier closed (we had to take a ferry across the river to another ferry), the fact that we passed up the hotel by a mile, and us unable to get into the hotel due to the arrival of (apparently) some important person(s) with military attache, this plan was a definite bust. 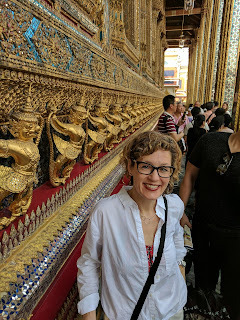 We never made it inside, although we did spend some quality time hanging out with the hotel parking garage attendant. Giving up, we exited the garage out to the street and flagged down a tuk tuk. 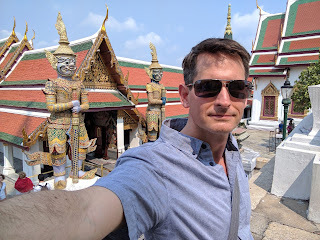 Wait, when you're an obvious tourist in Bangkok you don't have to flag down a tuk tuk or taxi - they will hunt you down, as the easy prey you are for price-gouging.... 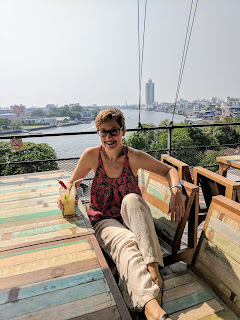 So we directed our inordinately expensive (but so worth it in our near-heatstroke conditions) tuk tuk to take us to the River Vibe rooftop bar, with views of the river (surprised?). 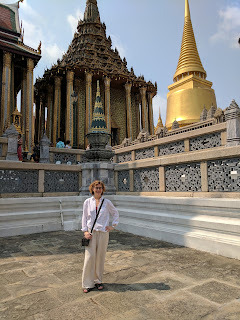 This was a destination recommended to us by our friend Wendy who had been there with a friend who was living in Bangkok at the time. After enjoying a brief respite, lovely views, and some cold drinks, we found a taxi to take us back to the hotel, where we could collapse for a brief rest before our venture to Chinatown for street food snacking later that evening (see post). A full, exhausting, but memorable day in Bangkok. 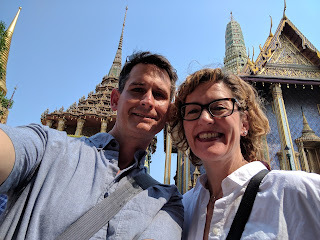 And a day that makes us excited to get to the islands for some laying around and floating in the cool blue waters of the Gulf of Thailand.